Dreams about Types of Food are extremely common. However, food as a general term needs to be broken down as much as possible. 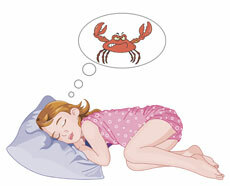 What type of food did you dream about? Sweet, sour, nice or nasty? Was you eating or preparing the food in your dream? Preparing food indicates that you are thinking about a future event and planning its implementation. Eating food can relate to a worry that has been 'eating away at you'. The types of food eaten can relate to things that have happened to you - sweet foods can mean a nice experience whereas sour foods can mean a nasty experience etc.